I’m not ashamed that like Connor, I also genuinely enjoy Disney movies, cartoons such as Phineas and Ferb, Adventure Time, Regular Show, Teen Titans - ah hell, I pretty much like Cartoon Network. I collect Pop Vinyls! Zelfs and Hot Wheels cars and I enjoy a good collectable - regardless of what it is. In all honesty I think I get more excited about the release of some toys than my own sons do. I took a few days (OK it was actually about three days)to pawn over the range of graphic comics available, I finally settled on Adventure Time or DreamWorks How to Train Your Dragon series. Again each of these series’ contained multiple comics within the one cover which in my opinion is great value for money. This graphic comic was created by Titan Comics, who also create Doctor Who, Assassins Creed, Regular Show and Warhammer to name a few. My choice and many others contains two stories within the one cover, call me a tad greedy but two comics over one will always get my vote. Connor also chose a two story graphic comic with Darth Maul being the main character. You can check out his review here of Darth Maul - Death Sentence. • Dragon Down |One of the dragons does missing and the hunt is on to find him – before the enemies do! • Dangers of the Deep | Stoick and Hiccup encounter something huge and deadly in the mysterious Veil of Mists. 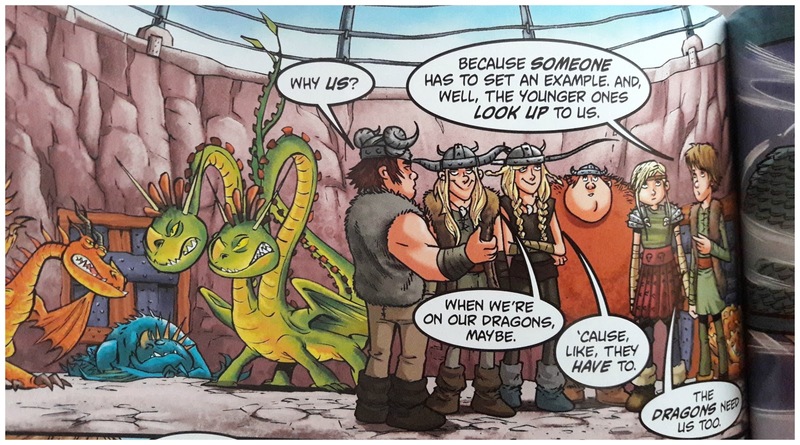 Some of the main characters from the series include Hiccup who is the main protagonist in the stories and movies, he lost a leg in an accident and was the first to ‘train a dragon’, Toothless is the main dragon, he, like his rider has a disability but neither of them let it affect their ability to problem solve, ride, or do good for others. Stoick The Vast and Valka are the parent to Hiccup and his friends include: Fishlegs, Ruffnut and Tuffnut, Astrid. • Toothless who is a Night Fury and is ridden by Hiccup. • Meatlug who is a Gronkle and ridden by Fishlegs. • Skullcrusher who is a Rumblehorn and is ridden by Stoick. • Hookfang is a Monstrous Nightmare and ridden by Snotloud. • Barf and Belch is a two headed Hideous Zippleback a is ridden by Ruffnut and Tuffnut. Each of the riders and their dragons are similar in some ways, very much like how owners these days match their dogs. Along with the species of dragons being different they each bring different characteristics to the story making it somewhat unconventional. I mean most characters these days (especially for children) don’t seem to have disabilities. Sometimes things go wrong in this series, sometimes they fall out and I like that. I like that they really are bringing an element of real life to the cartoons and comics because that’s what kids and adults need to see and read. To remind us that hell, life isn’t always rosy and you know, things work out fine in the end. 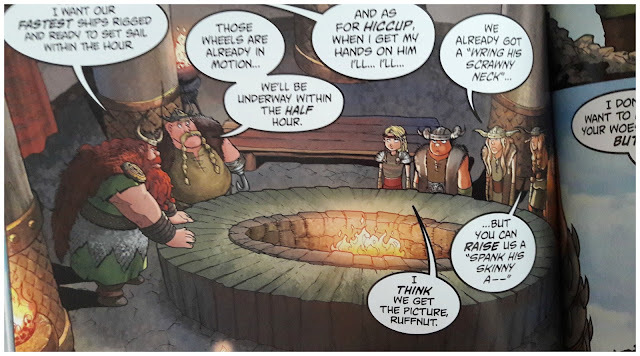 Just look at this example of the imagery, here you will see the gang ranting about Hiccup (as usual). Look how detailed the artwork is without it being pixelated or grainy. The images are sharp, their clear and, they get the mind working overtime. You really can imagine being in that place at that time (yes I know it’s not a real place). The covers also are of a super high standard, the print work on these is awesome and because they are super glossy, they will last a long time without easily being marked, scratched or ruined. I like that *winks* I like things that last and are easy to care for. Well, it’s partly due to my sons. Over the years we’ve enjoyed many DVD’s with How to Train Your Dragon’s being one of them. Every time it would come on I’d always say in a very deep and manly voice with a strong Scottish twang ‘How tae trrrr-ain yur draguns’ and the boys would laugh and copy me. 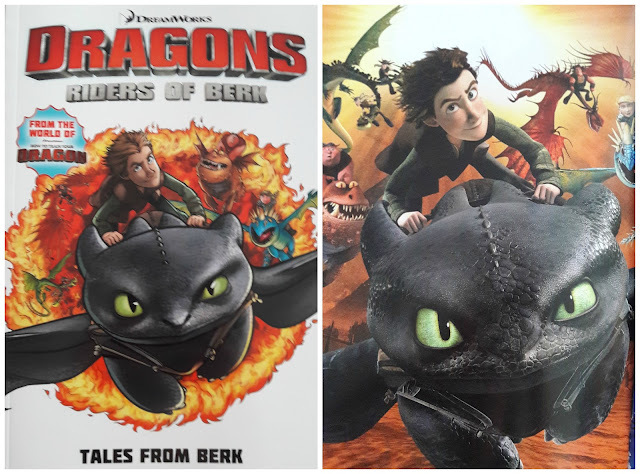 Because of that, and my youngest sons love for Toothless (the main dragon) I couldn’t not choose this option. Yes I will benefit, but ultimately so will my sons as I know each of them will also get enjoyment out of the comic. So value for money this is definitely up there. Not all of my sons are into reading novels, but this type of graphic comic they absolutely all will enjoy. As a parent anything I can do or buy to get my sons using their imagination and reading more is money well spent or time well spent in my opinion. You don’t need me to tell you to go and check out their range of comics but if you’re oohing and ahhing over whether you would enjoy one of these, or you ‘could’ enjoy one of these without the backlash of someone saying ‘you’re not a child’ then my answer to that is absolutely Yes, Yes, Yes! Check out the range (first book in a few days of online browsing, you’ll thank me later) over at Speedy Hen. Let me know which one’s stand out or what you’ve purchased yourself. Should we get the #graphiccomicohms going (!!!) for mums or dads who prefer to read graphic comic and ‘not adult’ rather than yoga and meditation? Very interesting article.Thanks for sharing such a good stuff.